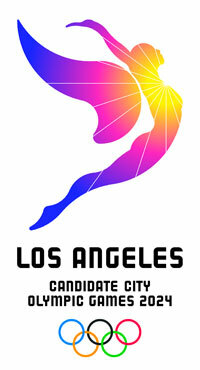 Moments after Los Angeles’ bid for the 2024 Olympic Games released its new flying angel logo – a new bid Website was launched featuring the new branding – and the city’s entire first stage bid book submission due into the International Olympic Committee (IOC) Wednesday. At the time of the launch, it was early Wednesday morning in Lausanne yet it is unknown whether the IOC gave the official go-ahead for the public release. The 69-page document carried few surprises but revealed the U.S. city’s bold approach to securing the Summer Games in the United States for the first time this century. Pages were dedicated to outlining the city’s vast experience and success hosting the Games and other events as well as building and maintaining infrastructure and legacies. LA has been credited with “saving the Olympic Games” in 1984 after the city was elected to host the event when no other nation came forward for the opportunity. Innovative sponsorship programs and sustainable, efficient planning made the Games viable after a decade of boycotts and blown budgets. Once again, the Olympic movement has been suffering a decline, and the recent approval of the IOC’s Agenda 2020 reforms is hoped to be the catalyst for significant change. Just as the Los Angeles 1984 Games helped transform Olympic and sponsorship marketing, we believe that LA 2024 will introduce transformative innovations through our region’s leadership in technology, innovation, marketing and promotion. The Games concept includes four clusters, the Downtown cluster including the Memorial Coliseum, the Media Village at USC and eight different competition venues; the Valley cluster hosting four sports including kayak, canoeing and equestrian; the Coastal cluster with six sports, the Olympic Village and the Santa Monica district with beach volleyball and triathlon; and the South Bay cluster with four sports including cycling, football, rugby and tennis. Bid organizers claim only one unplanned venue needs to be built to host canoe slalom. The dates of the Games are planned from July 19 to August 4, 2024 and under the meteorology heading the phrase “Perfect Weather” is prevalent. Under environmental concerns, the bid team boasts “refreshing air quality” and “clean and clear water” – a stark contrast to ongoing issues in the preparations for the upcoming Rio 2016 Games. LA also sees many benefits for the city including sport legacies and a boost to infrastructure. In the development of our Venue Concept and the Games Transport Plan, LA 2024 can be a catalyst to help the City accelerate public infrastructure projects already in progress. Unlike the recent trend towards public opposition to Olympic bids around the world that have seen cities drop out of the running in spades, LA rejects this possibility as a concern. A poll conducted by the bid in August 2015 indicated that 81 per cent of Angelenos support the city’s Olympic bid, so unlike opposition that derailed Boston’s efforts and Hamburg’s bid last year – and that is pushing for referendums in Budapest and Rome – LA seems safe. …any future ordinance passed by the City Council to facilitate the Games could theoretically be reviewed by a referendum process; however, there is currently no public campaign, nominal or organized, to oppose LA’s efforts to bid for the 2024 Games. The bid committee has budgeted from $40 to $55 million to operate its bid campaign up until the vote in September 2017. That runs just short of the $60 million proposed by Budapest and Paris – but LA says it is acting “prudently and responsibly” and that the funds that are required are already available from private sources. LA 2024’s candidature is completely privately financed. Within three weeks of our launch in September 2015 we secured USD 35 million in cash commitments from private donors. Bid books from LA, Budapest, Paris and Rome are expected to be received by the IOC in Lausanne electronically on Wednesday and then once approved they can be released to the public. Rome and Paris have scheduled formal ceremonies to coincide with the release of their plans Wednesday.